Drop the Chord plug-in to the left of the Scale effect (if you put it on the right of the Scale, the chords will be out-of-key). Use the “Shift” knobs to set the notes in the chords. The Shift knobs work in terms of steps: if the first knob is set to “+3,” and you play an E on the keyboard, the Chord effect will add a G (which is three steps above E in the piano roll) to the output sound. For a minor chord, set the first Shift knob to +3 and the second to +7. Play a note on the keyboard to hear the chord; if the chord is too high-pitched, set the “Transpose” control on the Scale plug-in to -12. 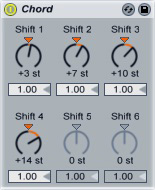 Right-click one of the numbers that run along the top of the rows and select “Map to Macro 1.” Ableton opens the Macro knobs section and maps the chain selector to the first macro knob. You can now switch between chords by turning the first macro knob: a setting between 1 and 8 will play a minor chord, a setting between 9 and 16 plays a minor 7th, and values 17-24 trigger a minor 9th chord. 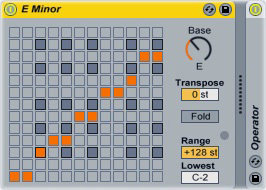 This setup works as long as you want to stay in a minor key; to switch to a major key, you’ll need to create nested MIDI racks. Open the major rack’s Chain Selector and set the first Chord plug-in to 25-32, the second plug-in to 33-40 and the last to 41-48. 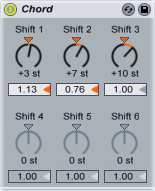 Map the Chain Selector to Macro 1, then map Macro 1 to the “Chain Selector” knob as you did with the minor rack. For a deeper look into building chord progressions, check out this video tutorial (click the link to get 20% off).